In one point in your life you must have wanted to take a full screenshot of a full webpage. Well today I will be showing you 3 ways to do this task for FREE! It will capture what youcan see in the window, the entire page, just a selection, a particular frame... basically it saves webpages as images - either to a file, orto the clipboard. It captures Flash too! "As the name implies, the site will produce a screenshot of any URL you send it — a full-page screenshot — not just the top screen. It’s a free, ad-supported service. 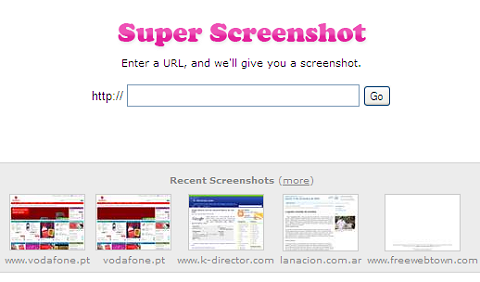 If you send a URL it already has on file, it returns the saved screenshot and gives you the option of refreshing it. Since any screenshot program has to download the actual web page in its entirety before it can make the screen capture, this will take anywhere from a few seconds up to a minute or more depending on how many images and ads the page contains (since we generally start reading a page as soon as the content is loaded, we normally don’t realize how long many page stake to completely load the last Google Analytics script or third-party ad). If too many screenshot requests come in at once there’s a queue since the hardware can only process so many screenshots at a time. But the AJAX-style updater gives you the current progress"
FastStone Capture is a powerful, flexible and intuitive screen-captureutility. It allows you to capture anything on the screen including windows, objects, full screen, rectangle regions, freehand-selected regions and scrolling windows/web pages. It has innovative features such as a floating Capture Panel, hotkeys, resizing, cropping, text annotation, printing, e-mailing, screen magnifier and many more. Download it HERE (Downloading it from here is critical. Fastone seems to have started to charge money for their software and this seems to be the latest freeware version.....do not upgrade)!